Wednesday night bourbon dinner – what a way to spend a March evening. 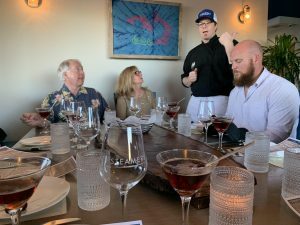 Many Outer Banks restaurants managed their way through winter with fun tastings and dinners. Steamers in Southern Shores hosted a number of events this winter but I had yet to attend. Well, that changed with the addition of a Woodford Reserve Bourbon dinner. 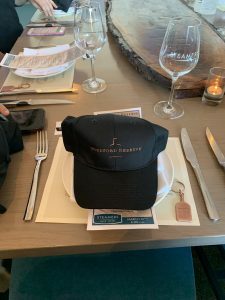 It was a not-to-be-missed for me, an opportunity to taste, learn and have perfectly paired food all while training my bourbon palate. My palate (haha), let’s talk about that for a sec, I knew nothing about bourbon nor have I ever sipped bourbon other than a mint julep for the Kentucky Derby. So, woo hoo, here we go! We arrived a bit early and found our seats, we had 4 in our group and were seated with 4 other awesome people. 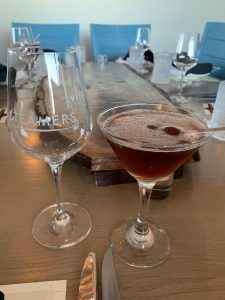 Once seated, Mike and Corinne, Steamers bartenders extraordinaire, quickly brought out our first drink, a Manhattan with brandied cherries and Chris Braswell, Steamers Chef, brought out homemade pretzel bites with smoked salt. 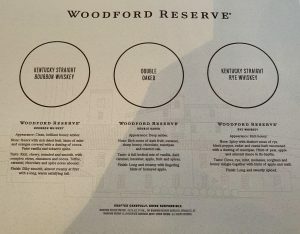 The Woodford Reserve reps from Raleigh and Charleston were also introduced and came around to greet each diner. We started with our first sip and bite – let the fun begin. Chris explained that food pairings would be served family style and a glass of Malbec was also provided. 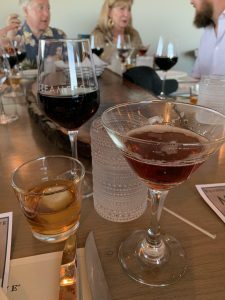 Our first course was complete along with a little getting to know each at our table – a Manhattan tends to help get the conversation started. The pretzel bites were salty and tasty which paired nice with the strong and sweet Manhattan. On to pairing #2 and the pile of yummy deliciousness. 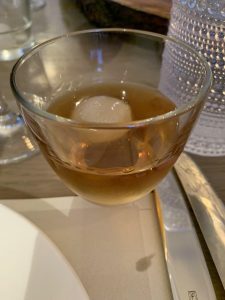 A glass of Woodford Reserve served to the diners specs – neat or on the rocks, fashioned with a mineral water made iced sphere, I went with on the rocks. 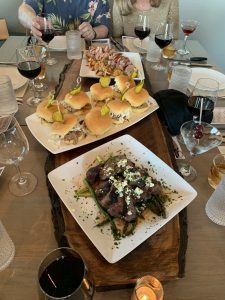 Paired with black angus beef tenderloin with blue cheese butter, smoked pulled pork served on a potato roll with slaw and a bread & butter pickle garnish, grilled duck with chipotle bbq, calabash asparagus and southwest smashed red bliss potatoes (with roasted poblano peppers – all the noms). 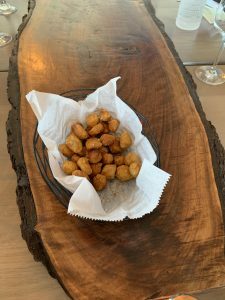 Spoiler alert: the red potatoes might be added to standard menu – I vote yes! By pairing #3, the conversation is flowing and so is the bourbon. Pairing #3 began with a Woodford Reserve Rye, again served with an iced sphere at my choice. 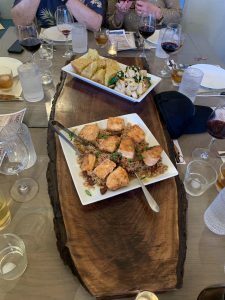 The parade of delicious food started with blackened shrimp & scallops, honey bourbon salmon, cajun rice with andouille sausage (yum) and jalapeno cornbread. The Rye was my favorite of the bourbons with it being a little lighter in flavor. 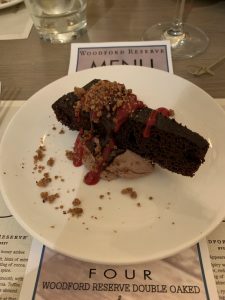 The 4th and final pairing was a Woodford Reserve Double Oaked Bourbon paired with a chocolate cake served over a chocolate mousse, berry drizzle and crumble. The bourbon was strong and cut through the chocolate with ease. This being my first bourbon tasting, I can say it was a delight and Steamers delivered on a memorable experience. The food was top notch, bourbon served with style and service was first rate. 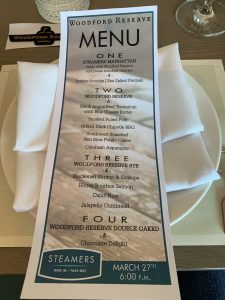 I would highly recommend Steamers for any of their food events and know you won’t be disappointed. Thank you to Mike, Corinne, Chris, Linda and our fellow diners for a lovely evening!